The scandal of the Greste trial – can ordinary citizens do anything? 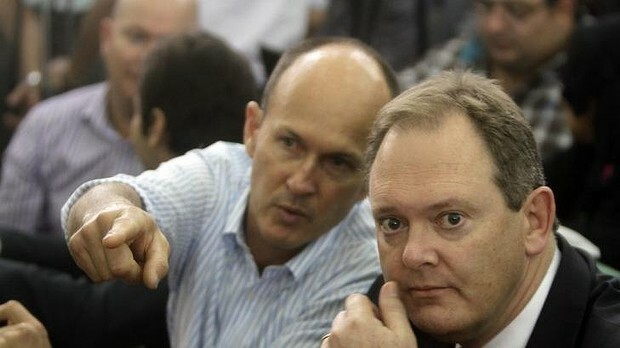 A highly-credentialled and well-respected Australian journalist (and his two Egyptian colleagues) are now in jail for at least seven years, after a farce of a trial that conclusively failed to produce any evidence that they had done anything wrong at all. Peter Greste slammed the cage he was being held in when he heard his fate, in a mixture of distress and anger. And well he might. His family and supporters reeled with shock at both the conviction and the savagery of the sentence. Fairfax Media laid out the background to this case. Egypt faces international condemnation over the harsh jail sentences handed down to three al-Jazeera journalists – including Australian Peter Greste – with human rights groups describing the verdict as a black day in the country’s unrelenting assault on the freedom of expression in the press and elsewhere. Egypt’s relentless pursuit of Greste, Canadian-Egyptian bureau chief Mohamed Fahmy and Egyptian producer Baher Mohamed was vindictive and politically motivated, Amnesty International said. Greste and Fahmy were sentenced to seven years in jail and Mohammed was sentenced to 10 years. The prosecution had produced no evidence to back its claims or to support a conviction, Amnesty said. Instead, the three were “pawns” in the bitter geo-political dispute between Egypt and Qatar, the oil-rich Gulf country that finances al-Jazeera. Qatar has long been perceived as a supporter of the Muslim Brotherhood, the multinational religious and political group labelled a terrorist organisation in Egypt late last year as part of a vicious government security crackdown on the group and its supporters. The Qatari government pumped billions of dollars in aid to support Egypt’s sinking economy during the 11-month term of the Muslim Brotherhood backed president, Mohamed Mursi. Once Mursi was forced from power by the Egyptian military, acting on what it described as a groundswell of public support, the retribution against the Brotherhood and its backers was swift and brutal. “The truth is that Mohamed Fahmy, Peter Greste and Baher Mohamed are prisoners of conscience who must be released immediately and unconditionally,” said Hassiba Hadj Sahraoui, Amnesty’s Middle East and North Africa Program Deputy Director. 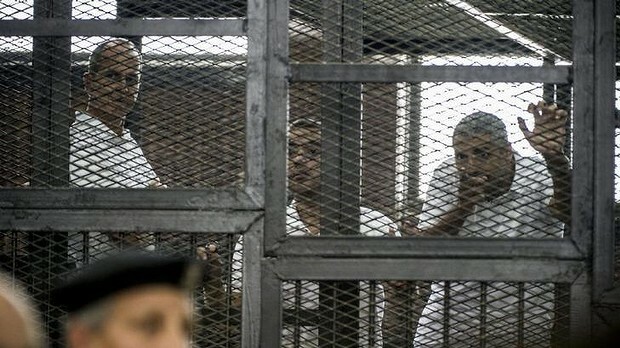 As journalists in Eqypt reeled at the implied threat from the kangaroo court trial, Peter Greste’s stunned family regrouped to plan the next phase of their campaign to free him from one of Egypt’s most notorious prisons where he has spent the past six months in a 3mx4m cell with his colleagues, the censures poured in from world leaders. Just a day after he visited Egypt to meet with President Abdel Fattah al-Sisi to announce the United States had released $US575 million in military aid that had been frozen since the ousting of Mursi last July, US Secretary of State John Kerry was scathing in his criticism of the verdict. “Today’s conviction and chilling, draconian sentences by the Cairo Criminal Court of three al-Jazeera journalists and 15 others in a trial that lacked many fundamental norms of due process, is a deeply disturbing setback to Egypt’s transition. Mr Kerry urged the Egyptian government to review all political sentences and verdicts pronounced during the last few years and consider all available remedies, including pardons. But despite his strong words there was no indication that the newly unfrozen military aid (including anti-personnel helicopters) would have any human rights conditions attached. The British Foreign Secretary William Hague confirmed Egypt’s ambassador would be summoned to the Foreign Office over the sentencing, which he described as “unacceptable”. The Dutch took similar action, with Foreign Affairs Minister Frans Timmermans confirming the Netherlands had summoned the Egyptian ambassador. Australian Foreign Affairs Minister Julie Bishop said the government was “bitterly disappointed with the outcome” – it is understood the Egyptian ambassador to Australia would be meeting with the Department of Foreign Affairs and Trade on Tuesday. Egypt’s foreign ministry appeared to reject the wave of international criticism, putting out a statement on Monday evening claiming the country’s judiciary “enjoys full independence, and the new constitution provides safeguards to ensure media freedom and to guarantee due process in judicial proceedings”. “The defendants in this case were arrested in accordance with warrants issued by the relevant investigative body, the Office of the Public Prosecutor; due process was adhered to with all of the defendants,” the ministry said, noting the journalists still had the right to appeal. But the ministry’s statement fell on deaf ears. 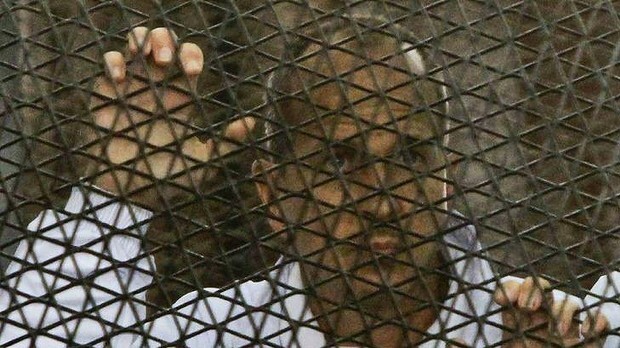 Greste and Fahmy were sentenced to seven years in prison, while Mohamed received a 10-year term. Out of six others on trial alongside the journalists, two were acquitted and four were sentenced to seven years. The court also sentenced a number of other journalists to 10-year sentences in absentia, including al-Jazeera journalists Sue Turton and Dominic Kane, both from the UK and the Dutch journalist Rena Netjes, who has no association with al-Jazeera. Egypt’s prosecutor general claimed the journalists had used un-licensed equipment to broadcast false information to defame and destabilise Egypt. Fahmy and Mohamed were further accused of being members of the Muslim Brotherhood. All deny the charges, as do the others who were charged and tried in absentia. Outside the court, Greste’s brothers Andrew and Michael struggled to make sense of the guilty verdict and the harsh sentences – both have been in court over the past six months and like all observers did not see any evidence presented that backed the prosecution’s claims. Vowing that the family would fight on against the conviction, Andrew said the Egyptian authorities assured his family the trial would be fair and the justice system independent. The family is considering both a legal appeal to Egypt’s Court of Cassation and an appeal for clemency or a pardon from President al-Sisi. The difficulty is than any judicial appeal, which should pre-date an appeal for clemency, could take six to twelve months. The United Nations Commissioner for Human Rights Navi Pillay also condemned the al-Jazeera verdicts. Along with Saturday’s confirmation by an Egyptian court of the death penalty for 183 Muslim Brotherhood members and supporters convicted in an earlier mass trial, the journalists’ sentences are the latest in a string of prosecutions and proceedings that have been “rife with procedural irregularities and in breach of international human rights law,” Ms Pillay said. “It is not a crime to carry a camera, or to try to report various points of views about events,” Ms Pillay said. “It is not a crime to criticise the authorities, or to interview people who hold unpopular views. What can ordinary folks do? Meanwhile, ordinary citizens of the world are left to wonder what can be done to impress upon the regime in Egypt how seriously people regard this fundamental attack on press freedom and individual rights. The immediate family – and the Governments concerned – must, to some degree, remain very diplomatic in their protestations for fear of enraging an already sensitive situation further, which would do Greste and his colleagues no good at all. Even so, calls are already being made by politicians and others for formal sanctions on the Cairo regime and its supporters, such as reductions in foreign aid, financial penalties and travel bans. It is unclear whether such things may eventuate. However such self-imposed restrictions on expressing anger need not apply to general public opinion, and the behaviour of individuals. Eqypt relies heavily on foreign trade to support its economy. One obvious opportunity is that if millions of people around the world decided to boycott Egyptian goods and services – and to refuse to take holidays in the country, as the Egyptians are very keen to increase their tourism trade – until Greste and his colleagues are released, and until the Government shows its bona fides on the rule of law and democratic freedom generally, then the newly-installed Egyptian regime would surely be immediately obliged to act. So one option is to vote against this outrage with your own money. If you decided to do so, it would make sense to tweet your actions. We could suggest using the hashtag #BoycottEgypt, for example. If you do, contact the media and tell them why you intend to #BoycottEgypt until the men are released. Express your feelings to letters columns, journalists, tweet to news organisations – tell anyone and everyone. Better to tell them ten times than not tell them at all. Raise awareness. You can re-post this blog, re-tweet it, stick it on Facebook, tell your friends. You can write, respectfully, to Egyptian embassies and to the Eqyptian government telling them why you are participating. And write to your own Government and insist they get involved. Google the details, they will be freely available. The other opportunity is to get involved with the Amnesty International campaign to free the journos. Take a photo of yourself holding a sign saying #freeajstaff with tape on your mouth, and make the point that journalism is not a crime. Tweet the photo using the hashtags Freeajstaff, #amnesty, #egypt, and #sisi. Copy any activity to #petergreste which is the hashtag used by the Greste family to co-ordinate news and raise awareness of the case if for no other reason than to let them know they are supported. We would like to stress, we are not affiliated with any Egyptian pressure group or political movement. We long for good relations with Egypt to be re-established and we would be delighted to announce tomorrow that any boycott or any other action is unnecessary because this decision has been reversed. We do not wish to harm or disrespect the people of Egypt.